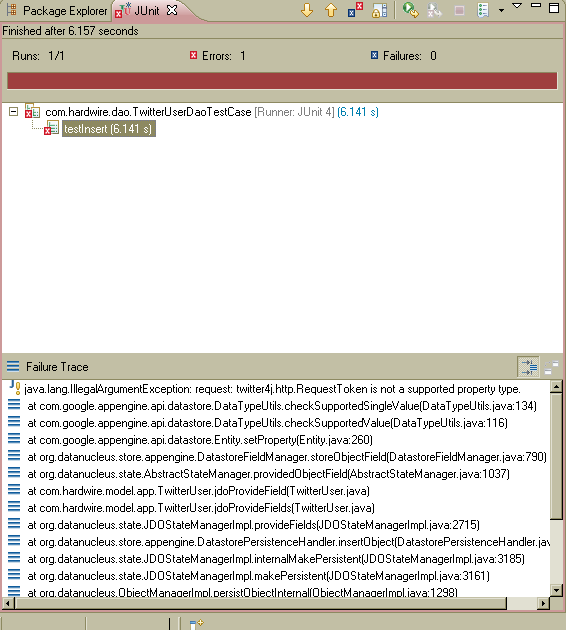 The way I use the Twitter class in Twitter4j, I have to instantiate a new Twitter class for every request I receive. The problem: I can’t seem to get my profile image after authorization even if the logs show that I can get the url of my profile image! but in my servlet where I try to get the url of the image, the description and screename everything is printed in the logs just okay. twitter4j.TwitterException: The user has not given access to the account. But with Spring’s MethodInvokingBean, this can be instantiated and injected to the objects who need it. This simple tutorial is a result of my trying to oauth to twitter using Twitter4j. This is a small functionality in my thesis. Anyway, I have been googling tutorials on how to use Twitter4j in a web app but I haven’t found much. The Twitter4j has examples but most of them in are written in a main method. I did find some a lead in the Twitter4j google group and much to my surprise, the key to accessing data in Twitter using Twitter4j/Oauth is knowing how Oauth works in the first place. This tutorial isn’t about how to use the oauth protocol there are many resources in the net about that . Try here, here and well, here. Although this code works, it might not be the right way to use Twitter4j and Oauth. It might not be optimized and it’s definitely not the best way. It’s actually riddled with bad practices! Although in my real app, I have refactored those code smells already. Another thing, I have yet to address why Twitter’s icon shows up after it redirects to the to callback url. I intend to work on that issues soon as well as optimizing the method. Comments and suggestions are highly welcome! (INTRO: I can’t seem to figure out how to use Twitter4j Oauth in a web app. The code in the website only gives examples in a main method. Googling Twitter4j Tutorial Web and other related searches returns nil useful results. Through this series of blogposts I HOPE to be able address this dearth. I am trying to persist an instantiation of class RequestToken onto Google’s DataStore. This is so that I can use that and an instantiation of the twitter class after Twitter redirects my user to the callback URL right after authorization. App Engine is easy to get started. Developers can take advantage of it’s automatic scalability. We just code and Google will do the rest for us! App Engine is reliable, has excellent performance and secure. App Engine offers Cost Efficient Hosting. It’s not expensive to get started with App Engine. If developers want bigger applications, additional fees are presented but definitely they’re worth it. Free trial period is over! Developers would be happy because it’s free! There are also many applications that use app engine already, meaning user base is established!